For years we’ve been waiting for a new Disneyland Paris website that keeps up with modern website design patterns from recent years. This morning, Disneyland Paris have launched their new United Kingdom website with a brand new design promising ‘a better and more responsive’ design. Gone is the clunky flash, and instead we have a sleek design with large beautiful images. It’s important to note that the embedded YouTube video is on a slider, along with beautiful promotional shots of the resort. I’m a little disappointed that a YouTube video has been used at all here, but it can’t be argued that video media is effective. Moving onto the Parks and Activities tab, and we see a newly presented calendar and attraction closure offering a less overall view at a glance and a more personalised view. This is good for families who know when they are going, but for those yet to decide, there is now a lot of clicking involved to find your park hours. 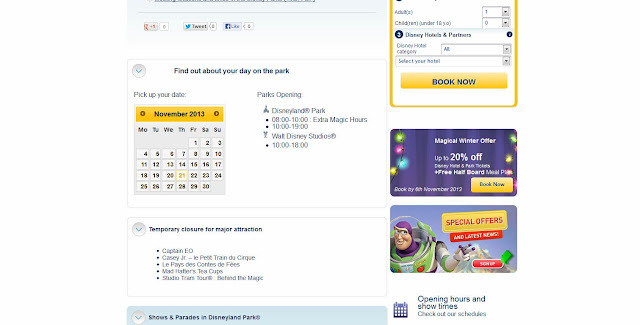 However, now a new page doesn’t load to tell you the attraction closures, in that sense this saves a lot of time. We were promised pages for each attraction, now I envisaged extremely detailed pages such as those found on DLRP Magic! – Regrettably that is not the case. However what we do find is a fantastic guide as to who can and can’t ride the ride, as well as a brief synopsis as to what can be expected illustrated by fantastic, large images. This is a useful tool in trip planning and could really help families in deciding what is and isn’t suitable for their party. Nevertheless, it would be great to see a sort of wait time estimation, nothing scientific but, like DLRP Magic, the words ‘Long, Very Long’ etc. could be used. Obviously an important part of booking your stay in Disneyland Paris is the hotels, these pages too have received an overhaul, again with beautiful images and more at a glance information using symbols (such as those on the attraction pages). 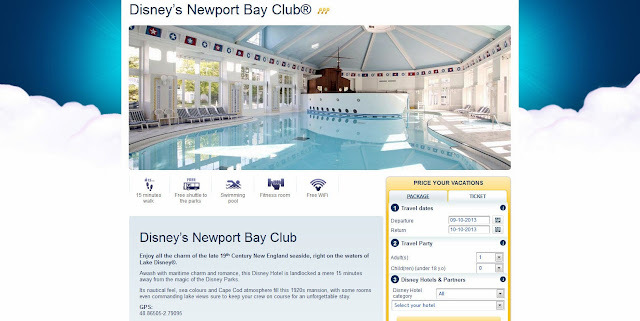 The sheer amount of information available on one hotel page is fantastic, from GPS Co-Ordinates, to reasons to pick the hotel, detailed information about the room you are booking as well as entire pages dedicated to the hotel restaurant and bars. 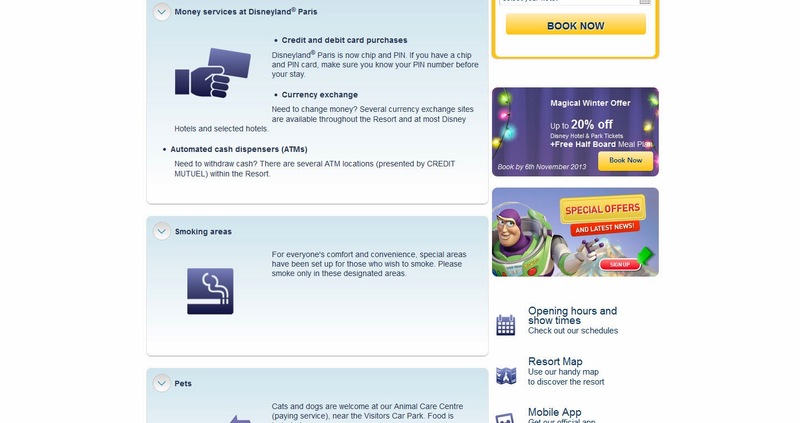 Disneyland Paris have finally provided you with all the information you need to make an informed choice of hotel. We also love the extended information pages on what to do once the parks are closed, thanks to extensive Disney Village information, and other attractions in the region. Disneyland Paris certainly has always done its bit to provide information in the resort as to what other attractions are available to guests, but now the website has an extensive set of pages dedicated to it. Choosing a place to eat in Disneyland Paris can be a difficult choice, especially with the lack of information available online. Not anymore! 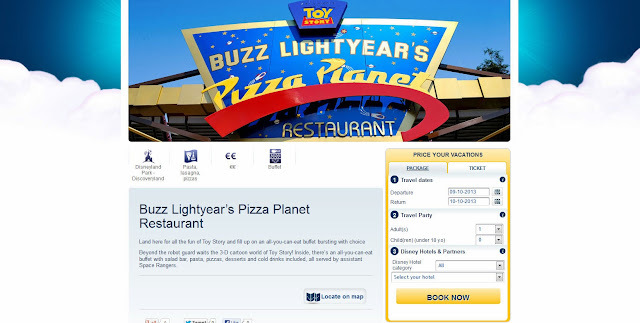 Disneyland Paris now provides a page for each restaurant which can be sorted into location, type of service and price. On each page you are given the restaurant location, brief background text as well as information about special dietary requirements and booking information (which unfortunately, still cannot be done on the Internet, only over the phone). The big new feature is the map. Now, this could sound rather unimpressive, however on the contrary. 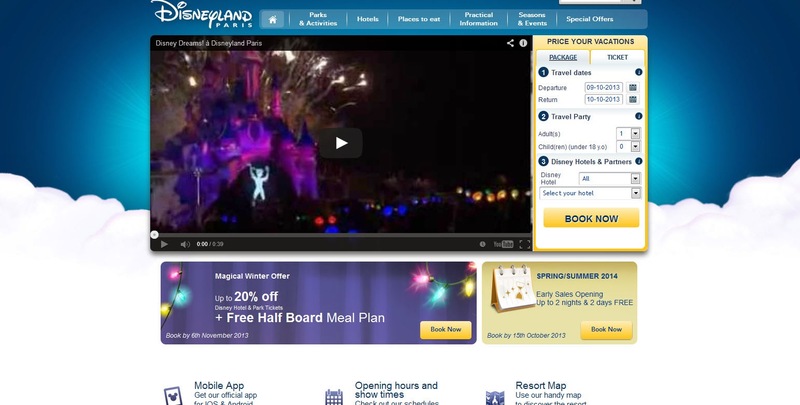 In the new Disneyland Paris website there is no more useful feature for trip planners. 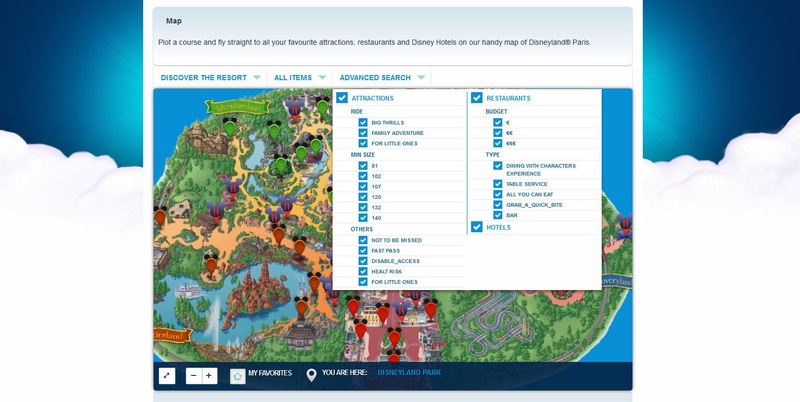 Each item, be it hotel or attraction, always shows a button on its page asking you to ‘view on the map’, click it and you’ll be taken to its location on the resort map. 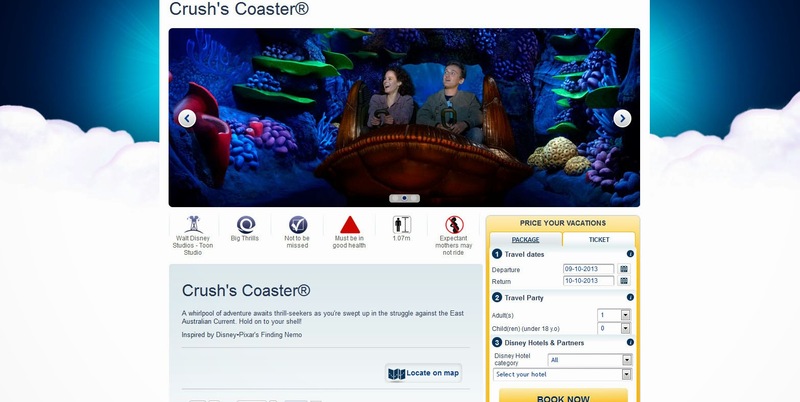 It’s the advanced search feature that will really help the planning.Not into big thrills? Remove them, don’t want expensive food? Just take them away. What you are left with is a map that tailors to your requirements and budget. If you have little ones, I know you’ll be sorting via the minimum height requirements. Planning a trip between friends? Click an item and copy the URL and they will be taken to the exact location on the map. You can add favorites and much more. This is singly handedly the most useful feature on the website, and one planners across the world are going to enjoy and find incredibly useful. Finally, the ‘Trip Planning’ tab is worth a look as there are all sorts of useful pieces of information and commonly asked questions answered. The new Disneyland Paris website offers useful tools to plan any trip, including a very impressive map function which I am sure will be used by many trip planners. This website will put a smile on every bodies face with the new sleek design, and well thought out features. For the second time this week, Bravo Disneyland Paris! Villages Nature: A new direction for Disneyland Paris?